Why Analysts Aren't Laughing At These Silly North Korean Photos : Parallels North Korea's bombastic propaganda and unpredictable leadership have made it a topic of frequent parody. But experts say it's time to take the nation's nuclear capabilities more seriously. An undated picture provided by the official Korean Central News Agency earlier this month shows North Korean leader Kim Jong Un talking with scientists and technicians. 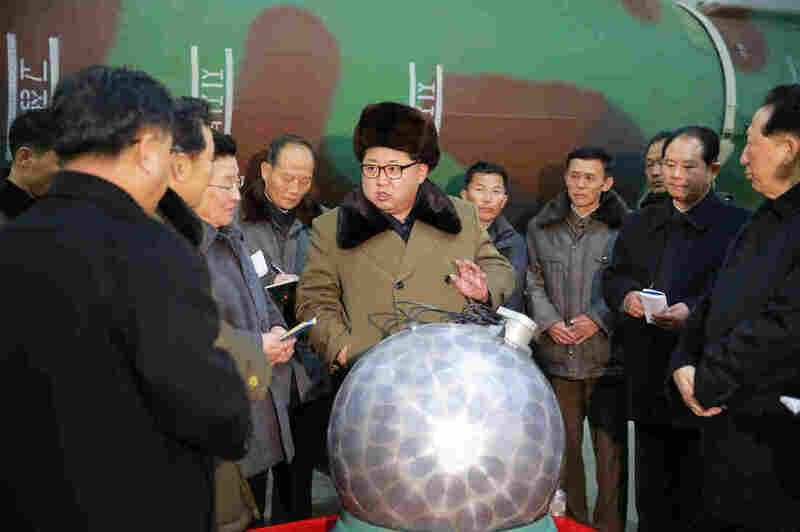 North Korea's nuclear warhead was jokingly dubbed "the disco ball," but experts say the spherical device, while likely a model, is probably based on a real nuclear weapons design. And yet even he finds himself having an occasional chuckle at the North's absurdity. The bombastic rhetoric and over-the-top propaganda are "kind of like 1950s Soviet Union on steroids," he says. The portrayals in films like The Interview and Team America: World Police don't help either: "In the back of your mind, you just have the image of Kim Jong Il's puppet singing 'I'm So Ronery,'" he says. But over the past few months, the experts have pretty much stopped laughing. That's because North Korea has undertaken an unusual number of tests in the first quarter of 2016, everything from detonating a nuclear bomb underground to launching a satellite on a rocket that could be converted to a ballistic missile. Keeping up with the pace of activity is "exhausting, to be honest," says Melissa Hanham, a North Korea analyst at the East Asia Nonproliferation Program of the Middlebury Institute of International Studies in Monterey, Calif.
North Korean propaganda videos like this one appear over-the-top. But experts agree that the nation is developing long-range rockets. What's clear, both analysts say, is that the North is working quickly toward its ultimate goal: a nuclear warhead small enough to fit on top of an intercontinental ballistic missile (ICBM). And it's making pretty good progress. A series of photos released by North Korea's propaganda apparatus earlier this March is perhaps the best example of how views are changing. It shows the country's current dictator, Kim Jong Un, the son of Kim Jong Il, posing in front of a shiny silver ball placed atop a chintzy red tablecloth. The ball is supposed to be a miniaturized nuke, capable of fitting on a missile. But, as with many North Korean photos, it looks kind of silly. "A lot of people started calling it the disco ball," Hanham says. There were disco inferno jokes on Twitter. But as experts started to analyze the pictures more closely, they weren't laughing. The ball on the table was obviously a model, but many of the details were reasonably close to a real miniaturized warhead. "They definitely know what a bomb looks like," Hanham says. "I mean, that model didn't come out of thin air. It's not a weird unicorn or anything. It has roots in the truth." The North has now had four nuclear tests — enough, according to many experts, for it to figure out the basics of miniaturization. Its progress has gotten the U.S. military's attention. Earlier this month, Adm. Bill Gortney, who heads the North American Aerospace Defense Command, told lawmakers: "It's the prudent decision on my part to assume that [Kim Jong Un] has the capability to miniaturize a nuclear weapon and put it on an ICBM." This is a change in tone from just a few years ago, when the U.S. intelligence community stated that North Korea didn't have all the tools it needed to send a nuke over American soil. Both Klingner and Hanham say there's no need to panic. North Korea's newest ballistic missile is untested, and they have yet to prove they have vital re-entry technology that would allow their warhead to reach its target without burning up in the atmosphere. But Klingner also says it's clear that North Korea is making lots of progress. "They're on a path to achieving a nuclear warhead capability that they can deliver to the U.S., Japan and South Korea," he says. And there is nothing funny about that.